National Savings of Pakistan government has held a prize bond draw of 100 Rs.in Lahore on 15th November 2013. This is 04th prize bond draw held in Lahore city so far Lahore on 15th November 2013. 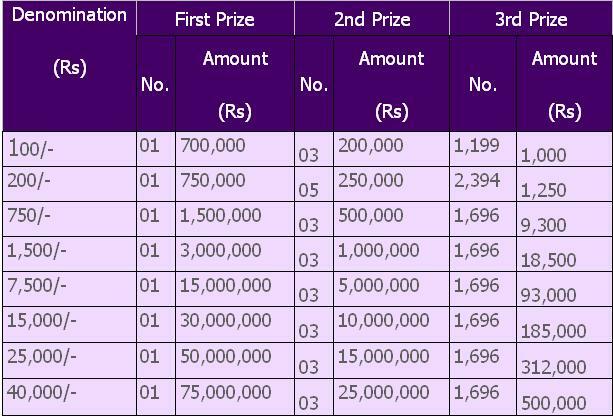 National Savings Prize Bond draw of Rs. 100 has been held at Lahore on 15th November 2013 . 100 Rupee Prize Bonds are one of the most sold prize bonds in Pakistan. This draw of Rs.100 prize was the prize bonds of this worth People but prize bonds and earns huge amount of money. Published by National Saving. Prize Bonds are an investment and a bearer type of security available in the denominations of Rs.200, Rs.750, Rs.1,500, Rs.7,500, Rs.15,000 and Rs.40,000 and now also available in the value of Rs 25000. These prize bonds are issued in series of alphabets & numbers each series has different alphabets and same number like other series. Each prize bonds series consist of one less than 1,000,000 bonds. Upcoming Prize Bond Draw will be the 04th Draw of Prize Bond Rs. 100 on Friday, November 15, 2013. Draw No. of 04th have First Prize Bond winner has got prize of Rs. 700,000/- and Second Prize Bond Winners got Prize of Rs. 200,000/- (Each 3 Prizes) while Third Prize of Rs. 1,000/- (Each for 1199 Lucky Numbers). National Saving of Pakistan is balloting Prize Bond Lucky Draw List of Rs. 100 in Lahore – 15 November, 2013. Prize bond lucky draw list of Rs. 100 in Lahore – 15 November, 2013. National Savings Organization is Pakistan Government best saving organization for the people of Pakistan. National Savings Organization is going to announce the Prize Bond Result of Rs. 100 List Complete – on 15 November 2013 on Biseworld.com. Each prize bond series consists of one less than 1,000,000 bonds.